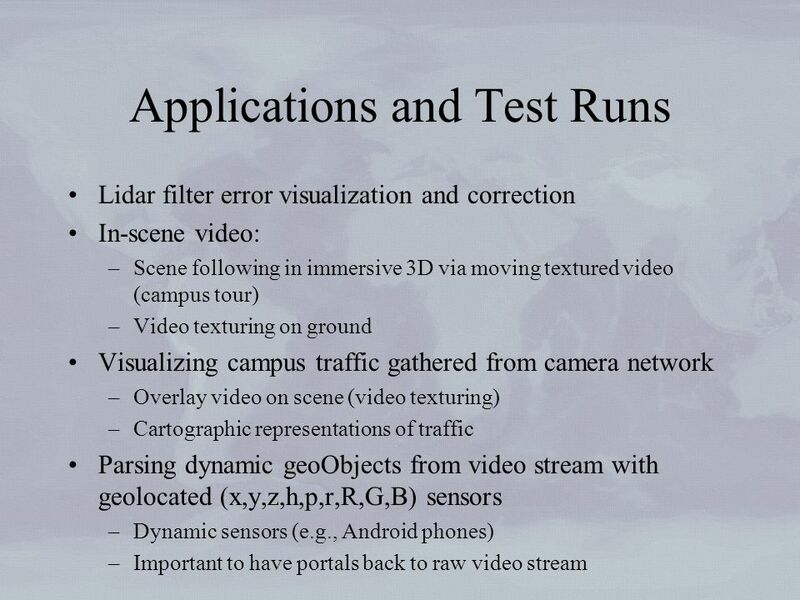 A Real Time Immersive Virtual Reality Testbed: Automation & Visualization Issues Thomas J. Pingel Department of Geography University of California, Santa. 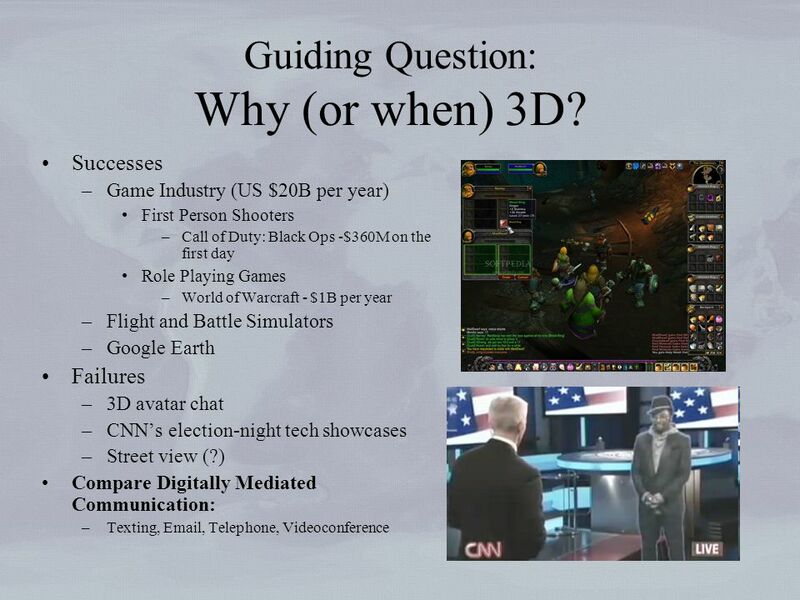 3 Central Research Question: How can an immersive geographic virtual environment assist in the interpretation, analysis, and understanding of specific, local events? 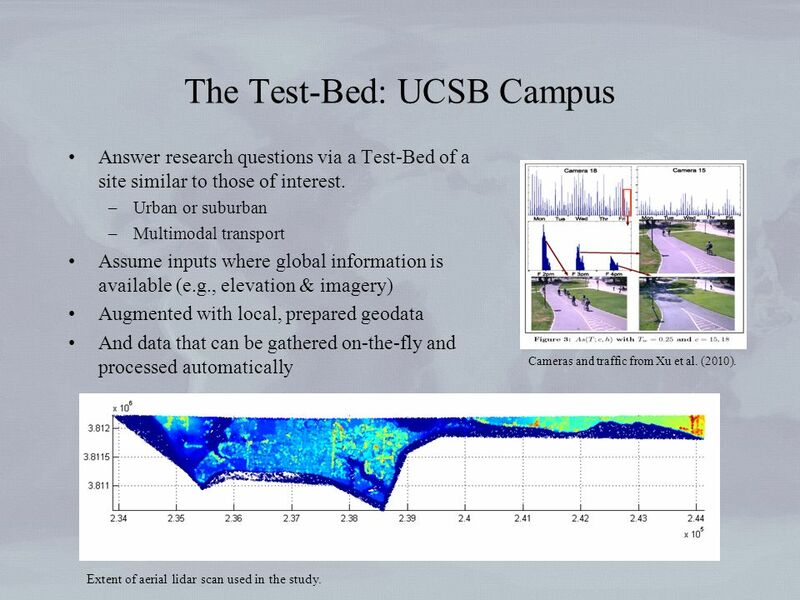 4 The Test-Bed: UCSB Campus Answer research questions via a Test-Bed of a site similar to those of interest. –Urban or suburban –Multimodal transport Assume inputs where global information is available (e.g., elevation & imagery) Augmented with local, prepared geodata And data that can be gathered on-the-fly and processed automatically Cameras and traffic from Xu et al. (2010). 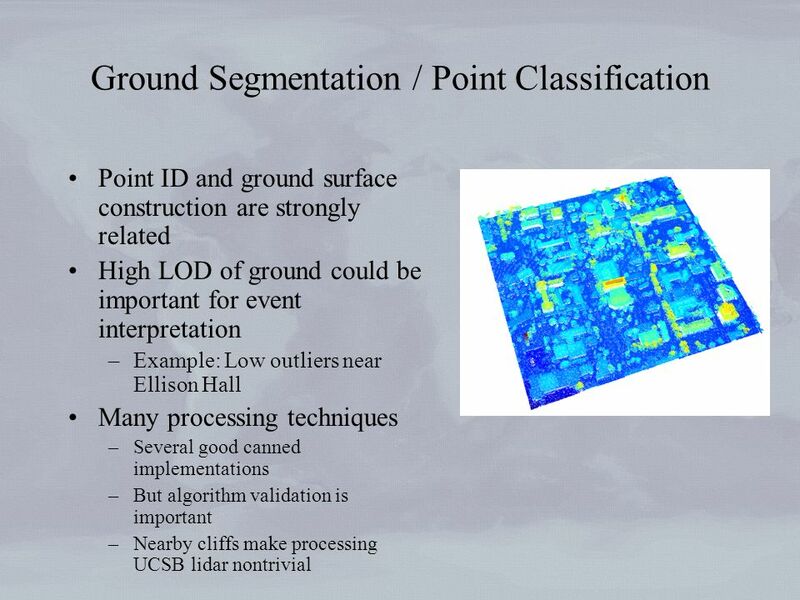 Extent of aerial lidar scan used in the study. 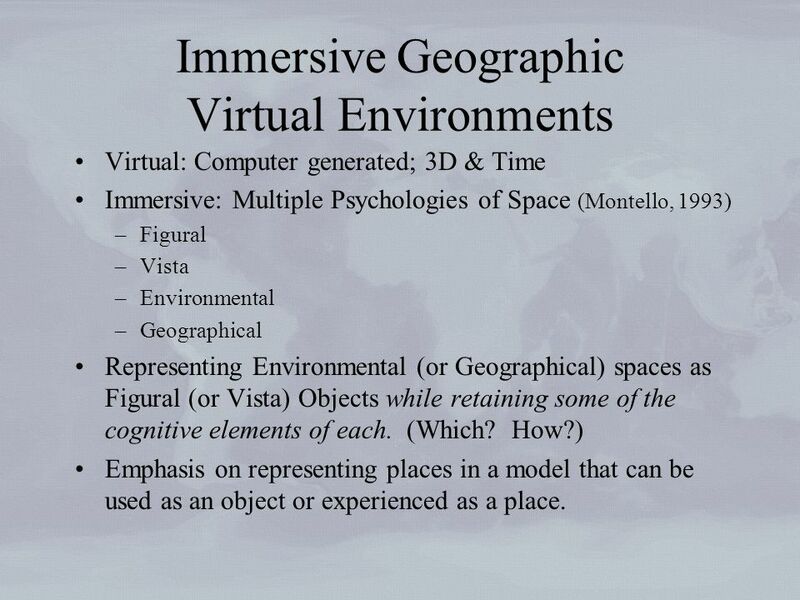 6 Immersive Geographic Virtual Environments Virtual: Computer generated; 3D & Time Immersive: Multiple Psychologies of Space (Montello, 1993) –Figural –Vista –Environmental –Geographical Representing Environmental (or Geographical) spaces as Figural (or Vista) Objects while retaining some of the cognitive elements of each. (Which? How?) Emphasis on representing places in a model that can be used as an object or experienced as a place. 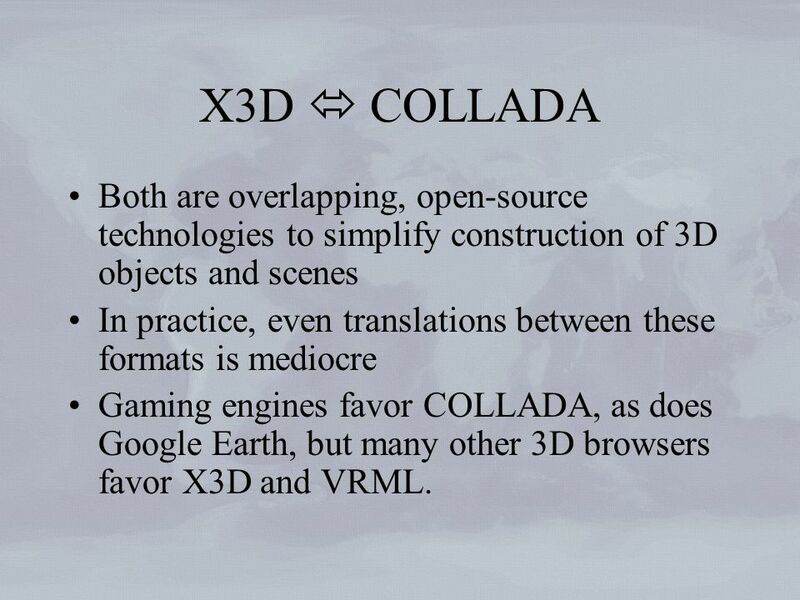 10 X3D COLLADA Both are overlapping, open-source technologies to simplify construction of 3D objects and scenes In practice, even translations between these formats is mediocre Gaming engines favor COLLADA, as does Google Earth, but many other 3D browsers favor X3D and VRML. 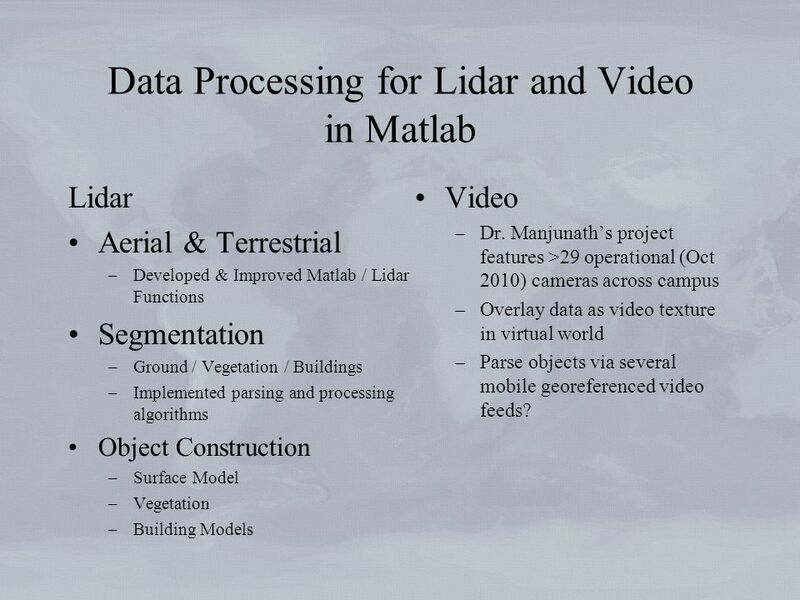 12 Data Processing for Lidar and Video in Matlab Lidar Aerial & Terrestrial –Developed & Improved Matlab / Lidar Functions Segmentation –Ground / Vegetation / Buildings –Implemented parsing and processing algorithms Object Construction –Surface Model –Vegetation –Building Models Video –Dr. 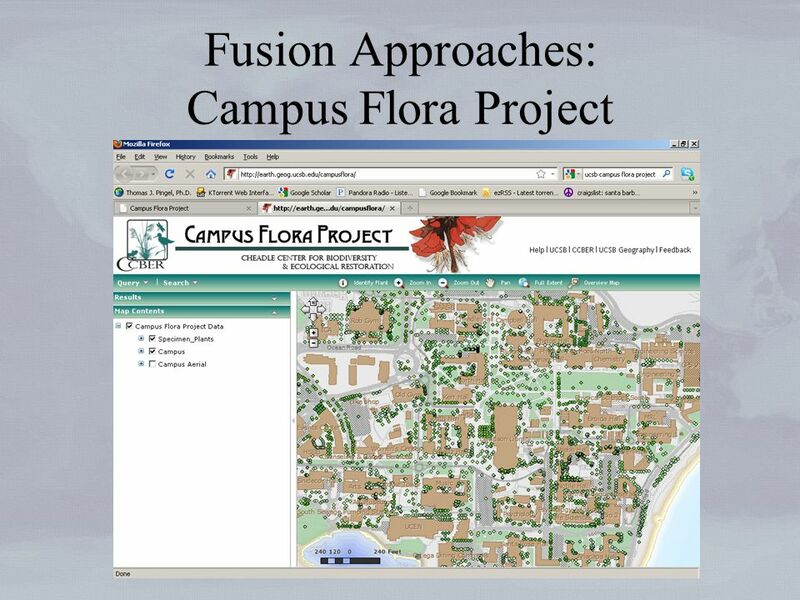 Manjunaths project features >29 operational (Oct 2010) cameras across campus –Overlay data as video texture in virtual world –Parse objects via several mobile georeferenced video feeds? 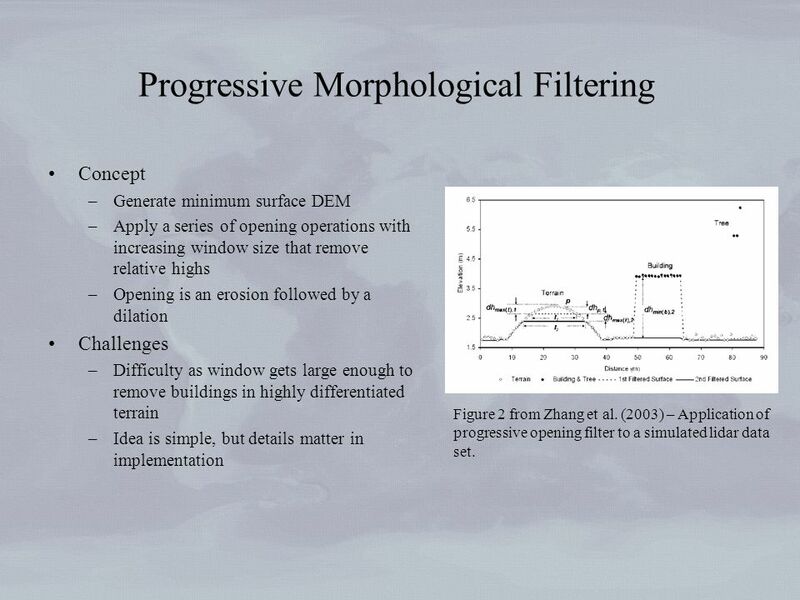 14 Progressive Morphological Filtering Concept –Generate minimum surface DEM –Apply a series of opening operations with increasing window size that remove relative highs –Opening is an erosion followed by a dilation Challenges –Difficulty as window gets large enough to remove buildings in highly differentiated terrain –Idea is simple, but details matter in implementation Figure 2 from Zhang et al. 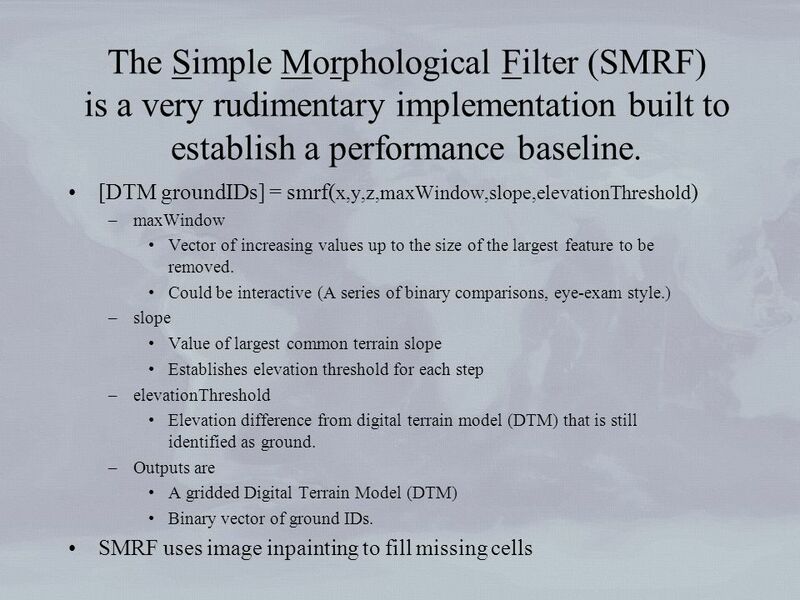 (2003) – Application of progressive opening filter to a simulated lidar data set. 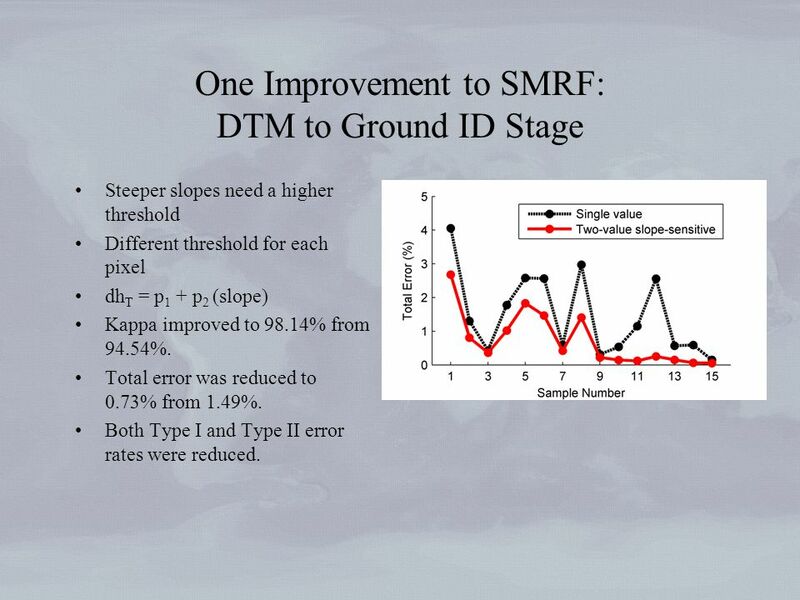 20 One Improvement to SMRF: DTM to Ground ID Stage Steeper slopes need a higher threshold Different threshold for each pixel dh T = p 1 + p 2 (slope) Kappa improved to 98.14% from 94.54%. Total error was reduced to 0.73% from 1.49%. 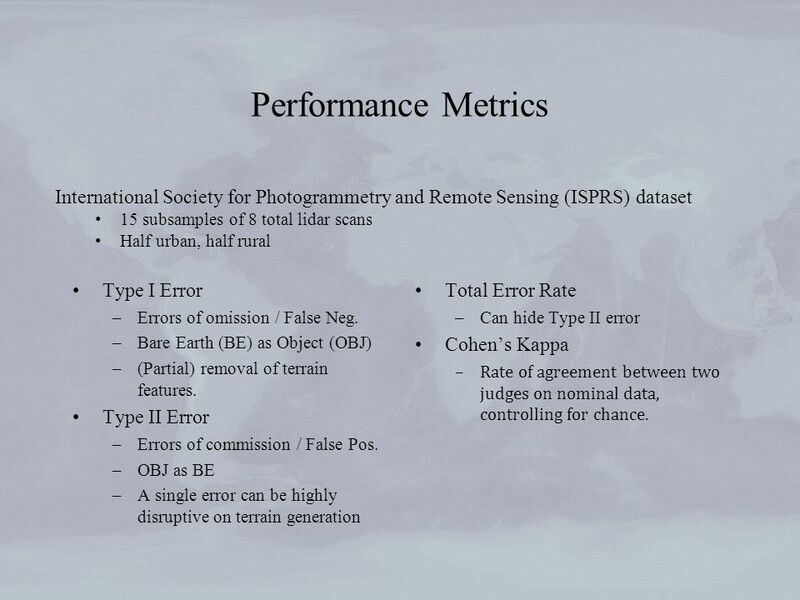 Both Type I and Type II error rates were reduced. 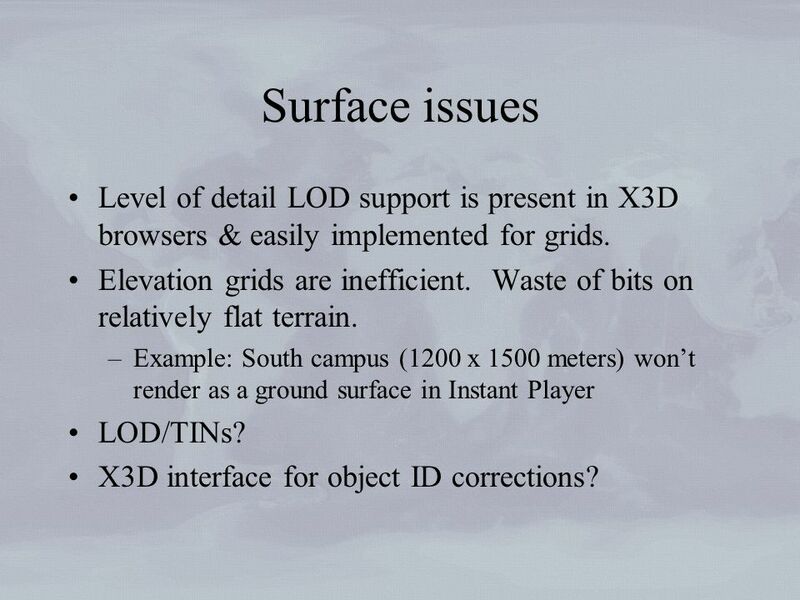 21 Surface issues Level of detail LOD support is present in X3D browsers & easily implemented for grids. Elevation grids are inefficient. Waste of bits on relatively flat terrain. –Example: South campus (1200 x 1500 meters) wont render as a ground surface in Instant Player LOD/TINs? X3D interface for object ID corrections? 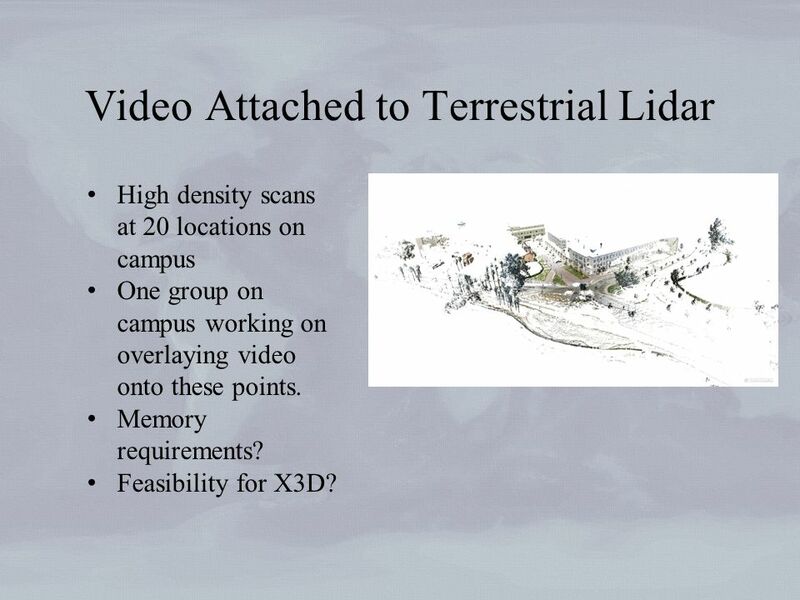 24 Video Attached to Terrestrial Lidar High density scans at 20 locations on campus One group on campus working on overlaying video onto these points. Memory requirements? 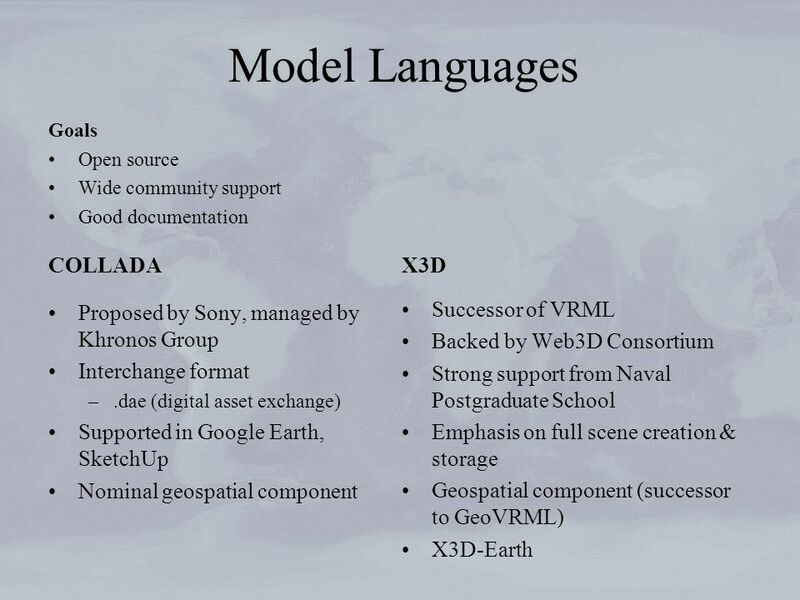 Feasibility for X3D? 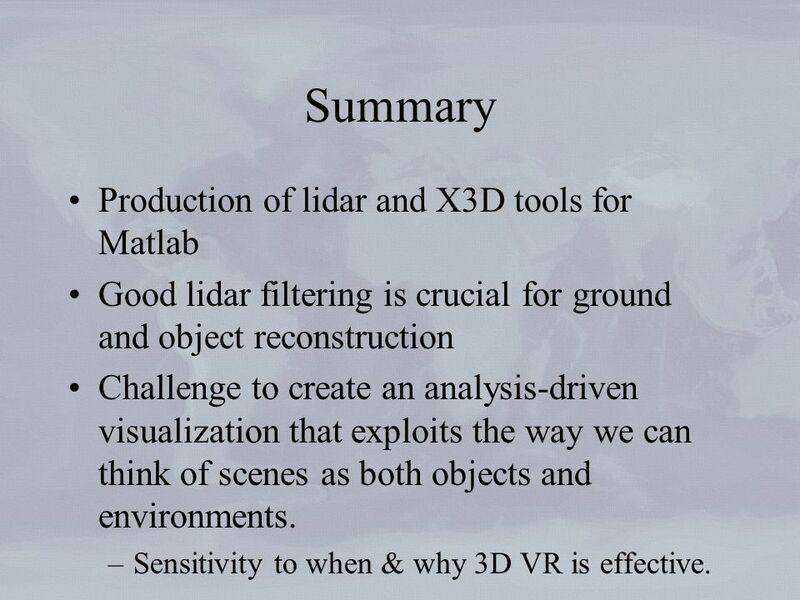 28 Summary Production of lidar and X3D tools for Matlab Good lidar filtering is crucial for ground and object reconstruction Challenge to create an analysis-driven visualization that exploits the way we can think of scenes as both objects and environments. 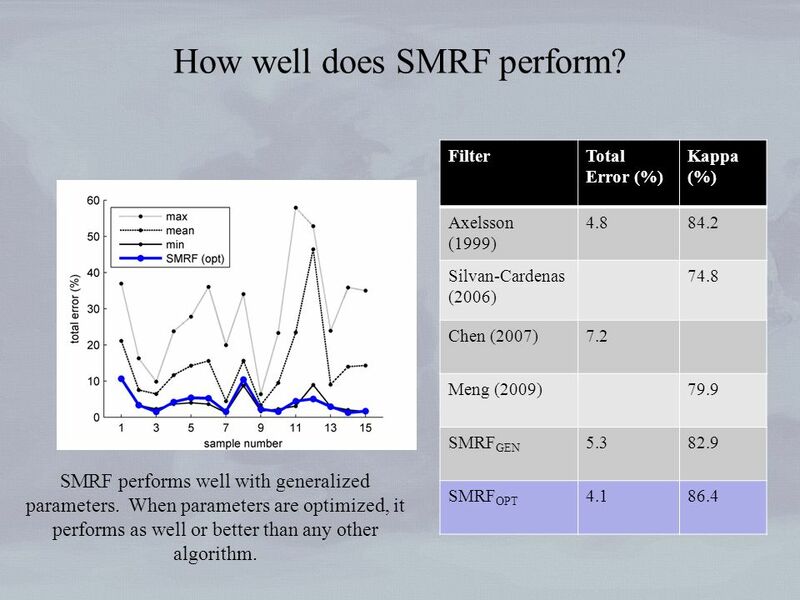 –Sensitivity to when & why 3D VR is effective. 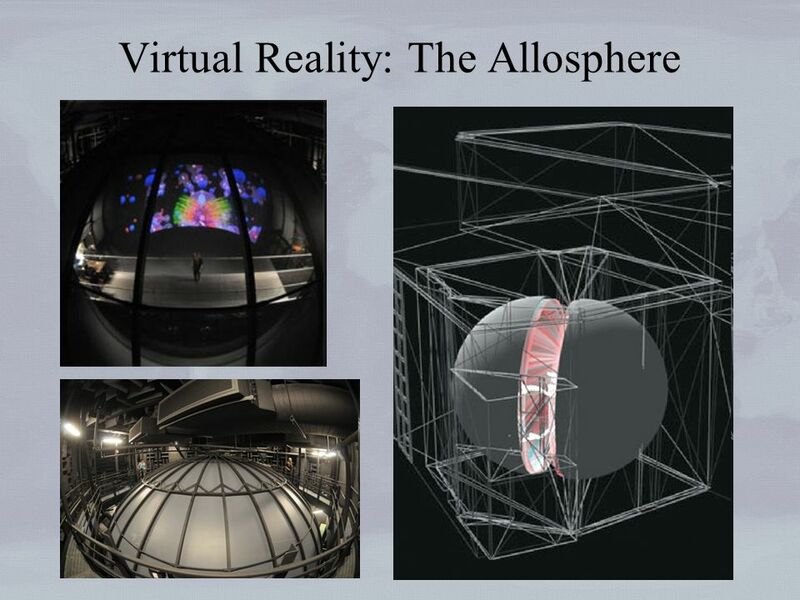 Download ppt "A Real Time Immersive Virtual Reality Testbed: Automation & Visualization Issues Thomas J. Pingel Department of Geography University of California, Santa." 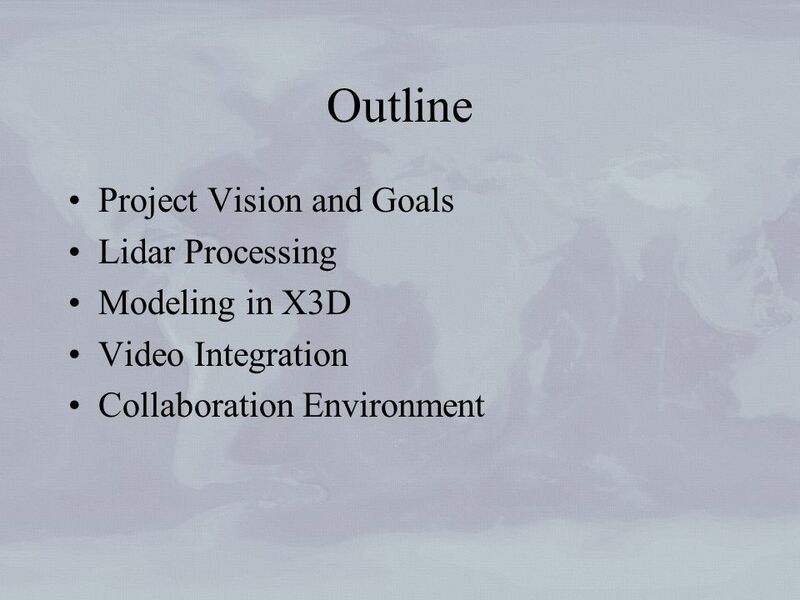 Objective We seek to design, build, and demonstrate a prototype real-time immersive virtual reality test-bed consisting of: 1.Integrated three-dimensional. 1 New Media & Media Formats for Future Media Internet Theodore B. Zahariadis, PhD Synelixis Solutions Ltd 10 Farmakidou Av. GR34100, Greece. 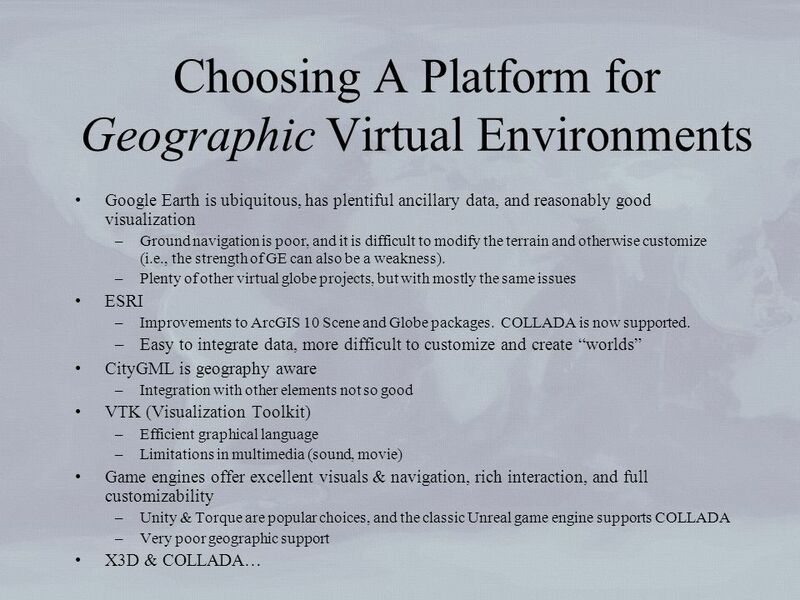 Free-viewpoint Immersive Networked Experience February 2010.
INTERNATIONAL INSTITUTE FOR GEO-INFORMATION SCIENCE AND EARTH OBSERVATION Towards quality-aware Infrastructures for Geographic Information Services Richard. A Natural Interactive Game By Zak Wilson. Background This project was my second year group project at University and I have chosen it to present as it. Presenter: Brittany Hebert Undergraduate Student Involvement: Bradley Jouty Faculty Advisor: Dr. Carolina Cruz-Neira Industry Supervisor: Donald Gremillion. Sheldon Brown, UCSD, Site Director Milton Halem, UMBC Director Yelena Yesha, UMBC Site Director Tom Conte, Georgia Tech Site Director Fundamental Research. 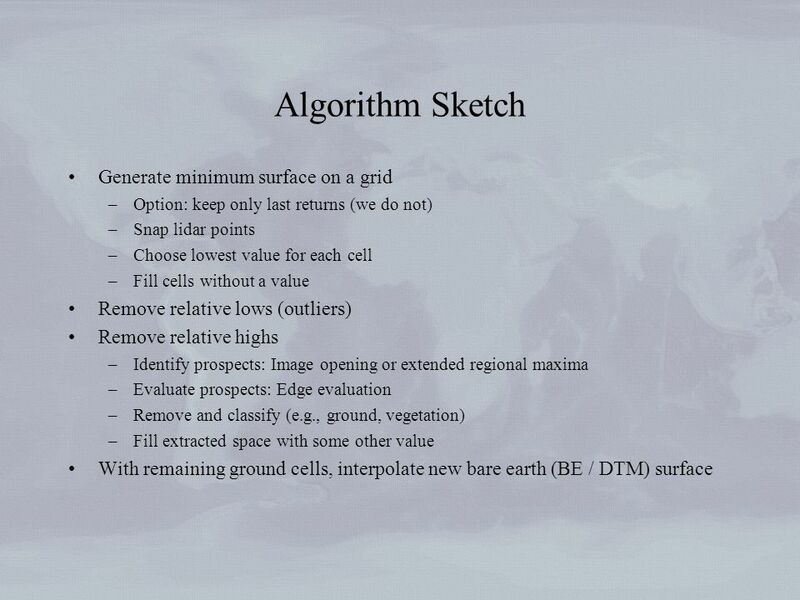 SCHOOL OF ENVIRONMENT Translating satellite images into meaningful geospatial information: The data fusion approach Mr. Amit A. Kokje PhD candidate, School. 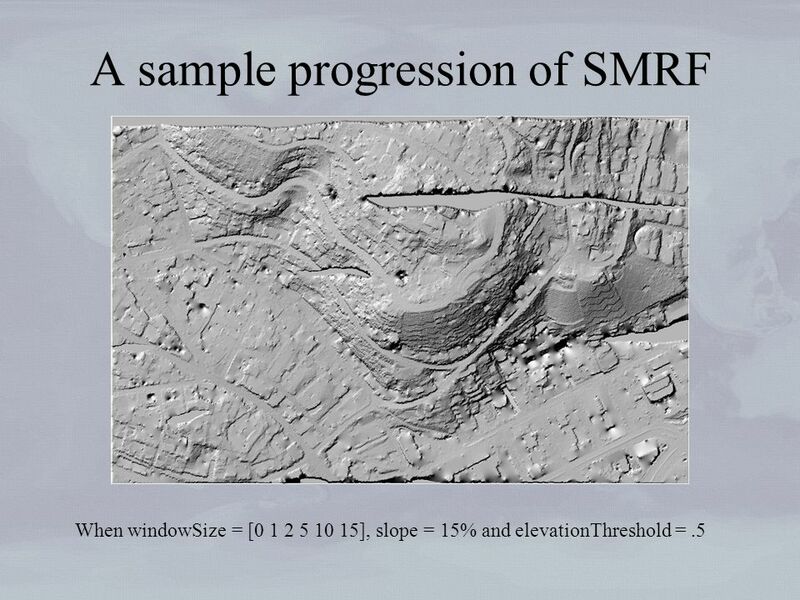 A Comparison of Digital Elevation Models to Accurately Predict Stream Channels Spencer Trowbridge Papillion Creek Watershed. Real-Time Cities: an Introduction to Urban Cybernetics Harvard Design School: SCI Spring 2014 Kalisha Holmes Exercise #2: Case Studies in Data. 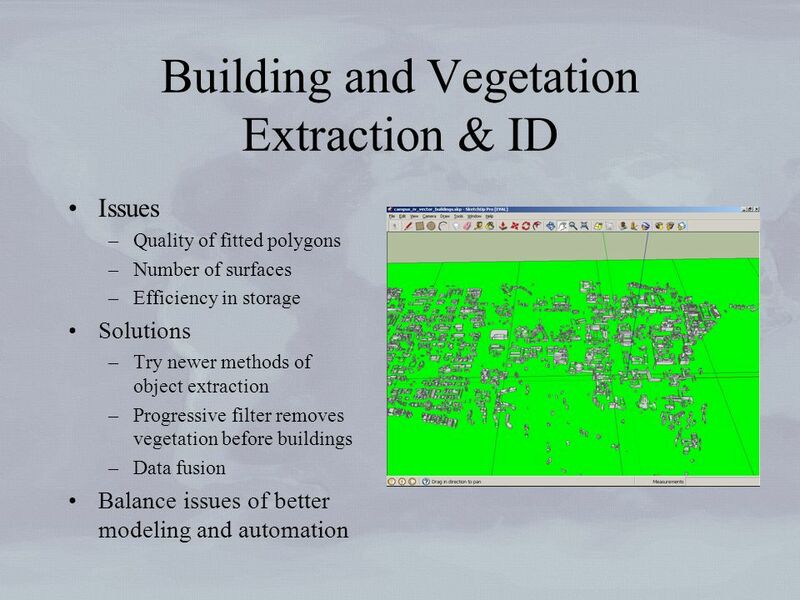 Fast and Extensible Building Modeling from Airborne LiDAR Data Qian-Yi Zhou Ulrich Neumann University of Southern California. 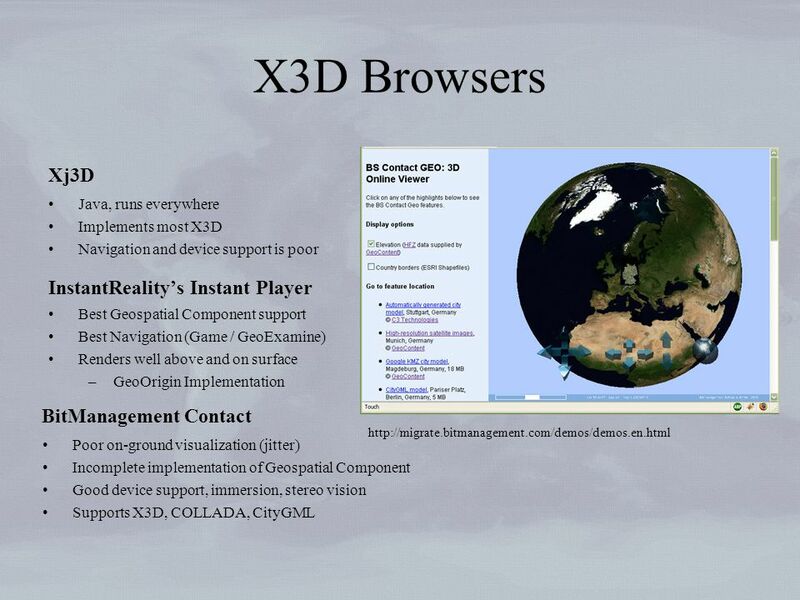 X3D Introduction to Web3D technology Enkhbold N. Information Communication University. 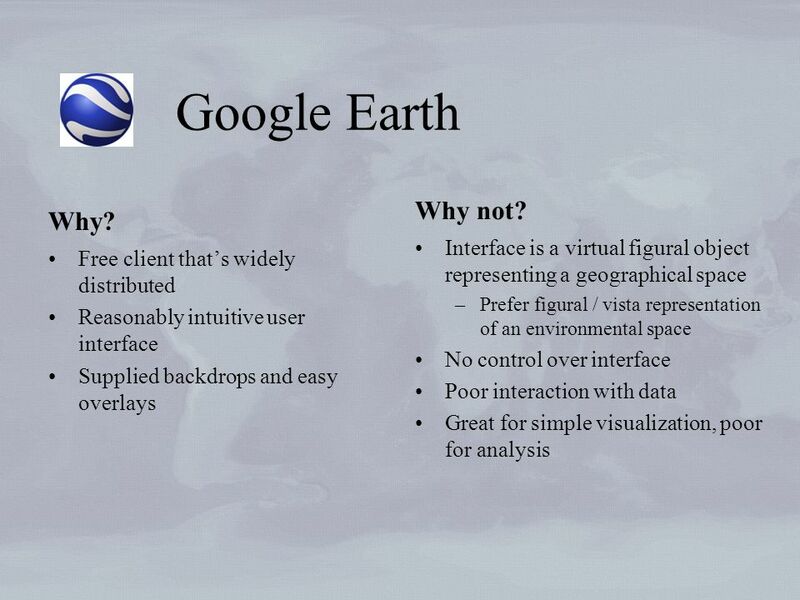 UBIGIous – A Ubiquitous, Mixed-Reality Geographic Information System Daniel Porta Jan Conrad Sindhura Modupalli Kaumudi Yerneni. Discussion on Video Analysis and Extraction, MPEG-4 and MPEG-7 Encoding and Decoding in Java, Java 3D, or OpenGL Presented by: Emmanuel Velasco City College. 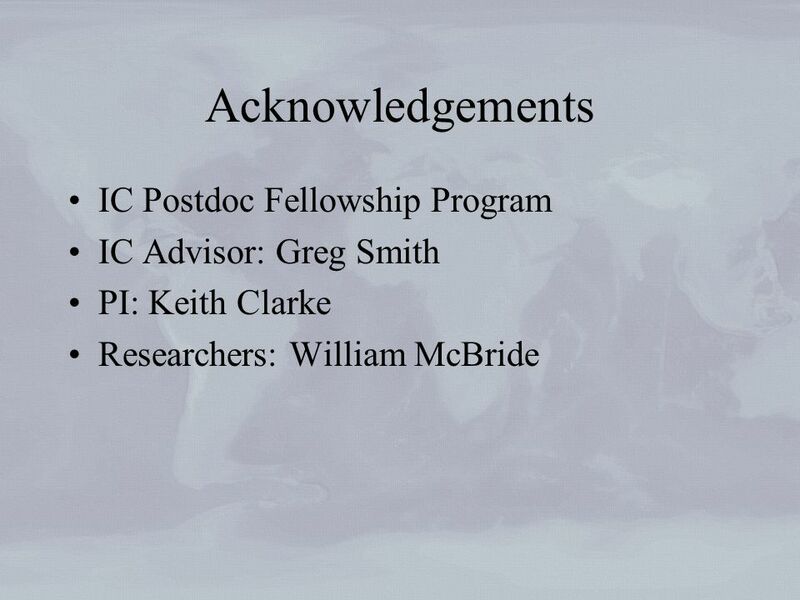 Celso Ferreira¹, Francisco Olivera², Dean Djokic³ ¹ PH.D. Student, Civil Engineering, Texas A&M University ( ² Associate. A Dynamic 3D Traffic and GIS Model for Enhanced Visualization in Planning Daniel Morgan Caliper Corporation May 19, 2009.